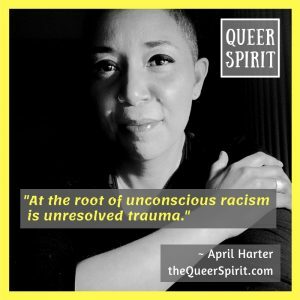 April Harter is a black, queer, radical feminist who specializes in reforming the perpetrators of racism through the Racist Signature™ Anti-Racism Method. “I teach anti-racism without shame and with loving compassion for my fellow human beings. We all have things we are ashamed of, and it is in those dark nights of the soul, that we convince ourselves that we do not deserve love or compassion. April tells us how she unexpectedly got into anti-racism coaching by working in her private practice to help white psychotherapists, and also after the events of Charlottesville. She discusses the importance of healing her own racial trauma before she could help perpetrators of racism. We talk about the difference between performative allyship versus actual healing from racial trauma through intervention; and how it’s a kind of deep shadow work and tuning into unconditional love. She unpacks the relationship of shame to racial trauma, and the effects of racial battle fatigue on POC. We talk about the deep commitment it takes to do the healing work necessary to heal racial trauma and overcome unconscious racism. 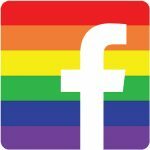 We compare and contrast unconscious racism and unconscious homophobia, and she exposes the thread of narcissism running through unconscious perpetration. April lays out her model of identifying Racist Signature™ patterns as a form of defense mechanisms in unconscious racist behavior. She shares about her different offerings to help people work on their unconscious racism, on social media, free e-book and e-course, community network and coaching programs.